As a homebuyer, or a mortgage rate shopper it is important to know when mortgage rates today in Florida are changing. This is due to when mortgage rates change; mortgage lenders will not be able to honor the same mortgage quotes they had previously given. When shopping for mortgage rates today in Florida, it is always important to be paying attention, because your home loan may change before you know it. To lock in mortgage rates today in Florida, you will want to contact your lender and commit to the rates before they move. By locking in your rate, you can assure yourself for a set period of time that rate. You must know though, that when trying to lock in a mortgage rate for a purchase loan, or refinance loan, the mortgage market does not wait for anyone. Mortgage rate analysis is based on mortgage-backed securities, known as MBS. The MBS pricing is provided through a website called MBSQuoteline, which is a real-time data market of mortgage rates available to loan officers, real-estate agents, and other financial professionals. The data supplied by MBSQuoteline is the same mortgage market data used to create mortgage rates today in Florida, used by the nation’s mortgage lenders. 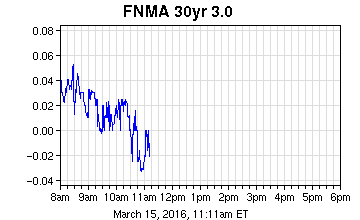 The chart above is a representation of Fannie Mae’s mortgage bond pricing. Fannie Mae mortgage bonds are linked to conventional mortgages, which include mortgage rates for programs such as the 3-percent down Conventional 97 loan, the HomePath mortgage loan program, and the HARP 2.0, which is the Home Affordable Refinance Program, among many others. A fact most consumers do not know, or understand, is that MBS prices are inversely related to mortgage rates today in Florida. 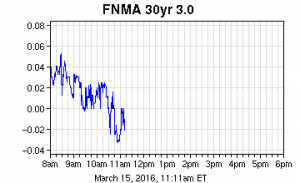 When the bond prices rise, mortgage rates begin to go down. Usually, a 25 point increase in mortgage-backed security pricing draws a 0.125 percentage decrease in today’s mortgage rates in Florida. Mortgage rates change every day, all day long. The mortgage rates you are quoted at your bank right now, will not be the same rate you will receive from your bank, or your lender an hour from now. Be smart when shopping for mortgage rates today in Florida. NSH Mortgage is always available to help, and will find you the best possible mortgage rate for your next home loan.